Executive HR search firms take great care to find the right human resources leaders for your company's success. This process takes some important traits into account to find a highly qualified individual to carry out your employee operations. HR executive recruiters must find someone who can effectively wear the many hats that an HR role requires. Take a look at these important traits that every HR executive must possess. When conducting an HR executive search, you"ll want to make sure your candidate is organized and orderly. From their time management skills to the way they file their papers, organization is key. If they"ll be managing a team, they are responsible for not only organizing their own documents but the paperwork of others that can contain sensitive information. Remember, they could be handling employee benefits and organizing a great deal of money. Look for someone who will keep everything in line for the safety and efficiency of the business in your human resources executive search. An HR executive must make ethical and fair decisions that are in line with the company"s values. They will be dealing with several issues that may require some tough decisions, but cannot sway from the core beliefs of the company. It"s important to understand when it"s best to negotiate instead of siding with an employee in an unfair manner. When it comes to talent acquisition, a good HR executive will not discriminate against any potential hire for their race, gender, religious beliefs, etcetera. When dealing with people and their careers, fairness is an important trait. If your HR executive will be handling new hires, it"s important to trust them to make smart hiring decisions. Over half (57%) of organizations say that employee retention is an issue. Did you know that 22% of new hires leave their job just a month and a half after their hire date? To prevent high turnover rates, a good HR executive will thoroughly review candidates to ensure they have a desire to stay with and grow with the company. In a work environment, there are bound to be conflicts and employee issues. If the issues make their way up to the HR director, they need to have honed their conflict resolution skills to ensure a positive outcome for all involved. Employees like to be heard when they have an issue; when conducting an HR executive search, look for someone who will listen to all parties involved and address the issue with tactical problem solving approaches. Finding the right fit is key. 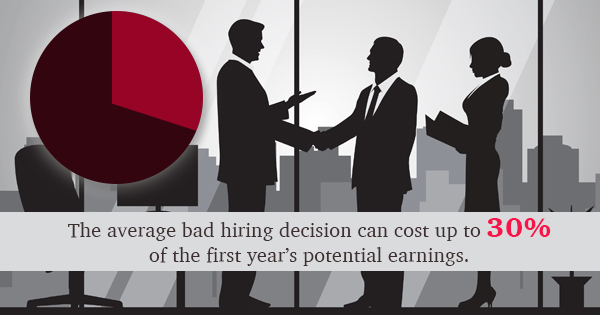 A poor hiring decision can cost your business; the average bad hiring decision can cost up to 30% of the first year"s potential earnings. Let the professionals handle your HR executive search needs to ensure the perfect professional fit.